AMD stock is on course for its best quarter since the early 1990s. RBC initiated coverage with an outperform rating. Ritholtz Wealth Management CEO Josh Brown bought AMD in July. An Advanced Micro Devices computer chip. 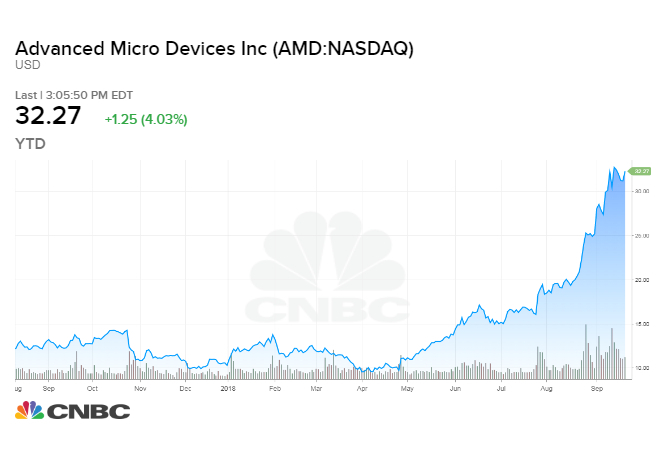 Shares of Advanced Micro Devices have gained more than one hundred percent in the past three months and one analyst believes there may be more room to go. On Monday RBC's Mitch Steves initiated the stock with an outperform rating and a 12-month price target of $40, representing 29% upside from Friday's close. RBC's base case puts AMD's earnings roughly 10% ahead of Street consensus due to higher sales growth and significant margin expansion. "Halftime Report" trader Josh Brown believes the bullish case for AMD is still in its early stages. The Ritholtz Wealth Management CEO bought shares of the chip manufacturer in July when the stock traded nearly $19 per share. "When you think about all of the areas of the market they're (AMD) selling into and the complete 180 they've done in terms of what they now position as their value proposition, these are the types of businesses that could go on a multi-year tear," he said on Monday's "Halftime Report." Shares of AMD are on course for their best quarter since the early 1990s. Josh Brown owns Advanced Micro Devices.